Ryan Murphy’s upcoming anthology drama American Crime Story: The People v. O.J. Simpson is putting together a cast that is starting to eclipse those of his American Horror Story seasons, at least in terms of wackiness. The latest addition to the show is none other than John “I’ve Got At Least Three Comebacks Left In Me” Travolta, in his first major TV role in 35 years. Sadly, the name “Vinnie” isn’t a part of it. As its title implies, American Crime Story is focusing its first season on the O.J. 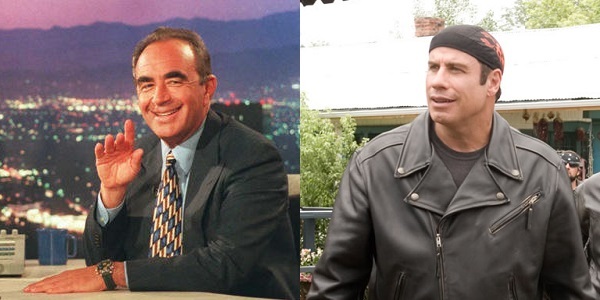 Simpsons murder trial of 1995, and Travolta is joining the show to play a member of Simpsons’ Dream Team defense, Robert Shapiro, a lawyer known for taking on high-profile cases involving celebrities and sports stars. I’m quite jazzed by this casting, as Murphy’s series rely on quite a bit of overly theatrical acting, and that’s right in Travolta’s wheelhouse. Face/Off and Broken Arrow, anyone? Travolta is twelve years younger than Shapiro, but he’s playing the part 20 years after the trial, so he’s only going to be seven or eight years away from Shapiro’s age when the case was happening. That’s pretty close, considering how Hollywood and TV tend to skew much younger. Here’s a shot of the two of them next to each other, because Wild Hogs. The Oscar-nominated Travolta will join David Schwimmer for the defense team, as the former Friends star is playing defense attorney Robert Kardashian. Simpson himself will be played by Cuba Gooding Jr., in one of the more bonkers casting choices I’ve seen in recent years. As far as the prosecution goes, only big dog Marcia Clark has been cast, with Murphy’s go-to actress Sarah Paulson taking the part. Also taking on producer duties for American Crime Story, Travolta hasn’t been a presence on television since Welcome Back Kotter was a ratings grabber. He popped up last year to re-team with Look Who’s Talking co-star Kirstie Alley for the latter’s TV Land series, but that was far lighter material than this. And given how Murphy likes to re-use actors, could this lead to Travolta appearing on the next season of American Horror Story? I think I should start a Change.org petition. Production on American Crime Story is set to kick off this spring in Los Angeles, without a real guideline as to when FX plans to premiere it. In other words, you’ve got time for quite a few $5 milkshakes while you wait.